On August 16, 2009, Sara and I were married. We had a covenant wedding and did not get a state-issued marriage license. God instituted the plan of marriage, so through study and prayer, we made the determination long before we were married that we did not need the government’s permission to be married. Since this time, the questions have poured in… How did you do it? How did you change your names? How do you file taxes? How does it work? I received another question just today. So in an effort to address these questions and others like them, I am creating this blog post. I’ll also post several resources at the bottom so that you can do your own research. I’m going to try and cover a lot here, but I’m sure I will miss some things! So please, if you have additional questions, post them in the comments and I’ll do my best to answer. Now, if you’re just stumbling upon this information for the first time, and are thinking, “why would you want to get married without a license?”, I would highly recommend first reading our Wedding Ceremony Booklet so that you understand exactly WHY we did this. That being said, let’s see what this whole no-license-marriage is all about, and how it works! First off, let me just say that even though what we’re doing is rooted in very old concepts, in today’s environment, we are breaking new ground here. The system currently in place is not made, nor does it appreciate people bucking it in the least. And so, this is most definitely a fight. One that may involve a bit of self sacrifice in order to gain ground. I think it is important to recognize what you are getting into beforehand. I challenge everyone not to take my word for it, but to study this for themselves. That being said, I obviously believe that this is a fight worth pursuing. I also believe that among the many fights that you can take on, the marriage license issue is one of the easiest! We know other people who have fought driver’s licenses, taxes, permits, and many other issues; but the marriage license issue requires very little in comparison. At least that has proven true for us. Some of these other issues require many hours spent in court, writing correspondence to government offices and/or court officers, and of course lots of money. However, not obtaining a marriage license essentially just requires your non-participation in various aspects of the current system. This is where the “fight” comes in. As I write this, the de facto government (the widely recognized government of North Carolina, and the U.S. federal government) still recognizes my wife by her maiden name, and not her married name, Sara Muncy. As far as we are concerned, to us, our friends, our family, everyone that is important to us, and in natural law — Sara’s name is now Sara Muncy. But because the marriage license helps to initiate the name change, the de facto government does not recognize the change. Now, if it is important to you to be recognized by this government, there are other ways to change your name. For us, this was not important. But this decision is up to you, depending on how far you want to take your battle. To change your name without a marriage license, simply go to the courthouse after you are married, and petition the court to change your name. The courthouse will post notice of the petition, and if nobody objects within a given time, the change will become “official” (at least in that government body). Every couple’s decisions about the above items are going to be different. Are you self-employed, or working for a corporation? Is your employer willing to change your name on your cubicle without something “official?” (That’s a fun one. When Sara was still “working for the man” her employer changed the nameplate on her cubicle with no questions asked!) Are your feelings going to be hurt that the IRS doesn’t give you that deduction for filing jointly? (remember that whole self sacrifice thing?) Will you even be filing taxes? Does it matter to you what name your bill collector puts on the envelope? Will your bank require you to have the same last name to open a joint checking account? Does that matter to you? Will you have children? Will THEY have slave numbers? These are all important questions to ask yourselves. When the government doesn’t recognize you as being married, and doesn’t even recognize that your name has changed, this affects a lot of things. We’ve discovered that for most of these things, there is a workaround. For example, we don’t have a joint bank account. So we operate largely in cash, and we just share the bank accounts we had before we were married. We both have access to the same information and we manage it just the same. Each of these issues has a different approach which we have had to discover for ourselves along the way. Once you’ve done your research and you and your future spouse have BOTH decided that this is the right step, you need to find a pastor who understands what a covenant marriage is all about. Again, the system doesn’t like this. North Carolina (de facto) state law requires that a marriage license be completed and returned to the register of deeds who issued it. Unless they understand and are willing to join the fight, most ministers or pastors will adhere to this law. However, there are a few good patriot pastors out there who will perform a marriage without a license. You just have to look in the right places. Chuck Baldwin’s Black Regiment listing is a great place to start. If you need help finding a pastor, let me know* and I’ll be glad to help you with your search. 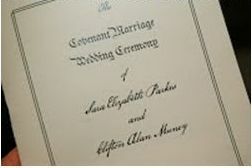 In addition to our covenant, we also created these Marriage Ceremony Booklets. Sara and I had a very small wedding. In fact, we only invited our immediate families and our grandparents. We did this because we wanted to focus on the covenant that we were making, rather than focusing on all the “fluff and pizazz” that normally goes along with weddings. Because our wedding was small, we were able to very inexpensively have these booklets printed and ready to hand out to our guests so that they would better understand why were getting married in this fashion. It really made an impact, and as usual, we got lots of questions. There was even a lady at the local Kinko’s asking us questions when we picked up the booklets! Things don’t suddenly become easier after you are married. Should I even have to say this? But things are especially harder if you have made the decision to buck the system such as we did. Keep talking about it after you’re married! Get together with your spouse and discuss your plan of action as it unfolds. Talk about it every day if you have to. Seek comfort in one another when you’re worried about how hard things are going to be. Pray about it together. As a result, your marriage will grow stronger, and your relationship will grow deeper. Discuss what you’ve done with other couples! Sara and I have had great fun telling people about what we did — encouraging others to break free from the molds that society, and the government, places upon us. Many of the emails we’ve received from readers seem to indicate that our usage of the word “pastor” has been taken quite literally. 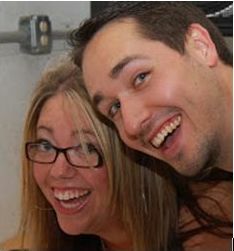 When Sara and I were married, we were fortunate to find an actual pastor of a church who would marry without license. However, as we’ve discovered from the myriad of correspondence, locating a pastor who is supportive of a purely covenant wedding is not that easy. In most de facto states, it is illegal for an actual pastor or ordained minister to officiate over a marriage ceremony without a license. That being said, we would like to encourage readers to think outside the box here. 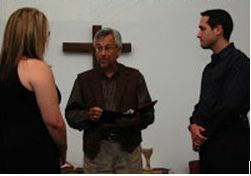 We truly believe that it is not specifically required that the officiant of your wedding be ordained or be a pastor. It is important to understand that being married through the vehicle of a covenant does not indicate some recognition or need for approval by a state or government body. Therefore, by performing a covenant wedding ceremony, we are reverting solely back to God’s requirements. The state’s “appropriate methodologies”, “requirements” or “recognitions” are irrelevant. As stated in the post, you simply have to decide which “benefits” you are willing to forgo. Ultimately, this decision is up to you, your comfort level, and resources. If you can find a willing pastor, great. However, we believe that it would be much more important to find someone who has similar beliefs and would be willing to perform a ceremony the proper way, rather than to require that person be a pastor, and/or to be ordained at the risk of having to ask the state for permission. In today’s modern society, where licenses are accepted as the norm, there’s honestly not much information out there on the topic. At least that’s what we’ve found. But if we look at it simply — which I believe God does as well — we see that the marriage covenant is a simple 3-part relationship: you, your spouse, and God. These are the three most important parts. Outside of this, adding the accountability of several witnesses, and someone to officiate the wedding if you like — this is all you really need. Remember that in a covenant, you are looking for God’s approval, and His alone. I would encourage you to research for yourself HIS requirements. So what do we do in the shadow of this court decision? 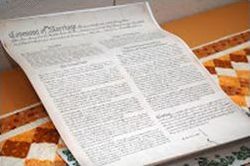 We can guess that the “homosexual marriage” juggernaut will keep pushing; we can assume that our culture will grow less and less tolerant of Christianity; we can foresee that our freedoms of religion and speech will likely be stunted; and we can wonder if we will be persecuted for faithfulness to the scriptures. But what can we do? Let’s be for something. Let’s celebrate God’s gift of marriage. Let’s resist the “revisionist view of marriage as fundamentally an emotional union” – that idea that as soon as the butterflies are gone, the marriage might as well be over. 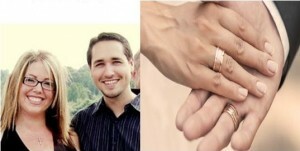 Let’s show the world what sacrificial love for our spouse looks like.